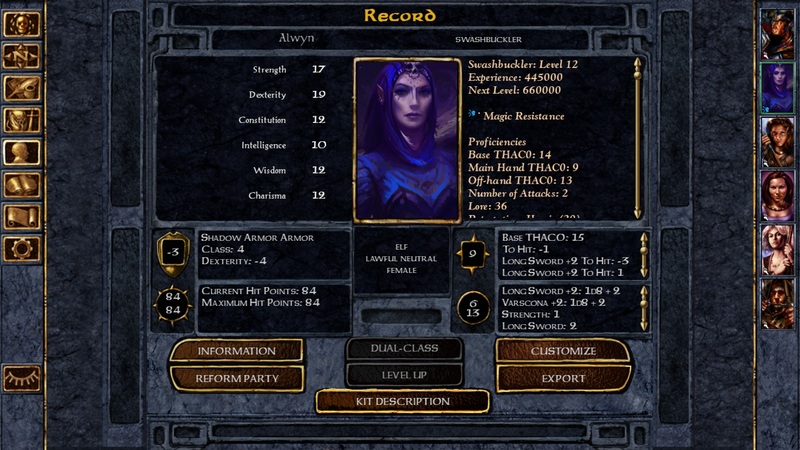 This mod enables you to reach level 40 in Baldur's Gate: Enhanced Edition. There are two files that you need to make this work. http://www.baldursgatemods.com/forums/index.php?action=downloads;sa=view;down=180 Level 40 Rules Set this is allowing you to go to level 40 in BG:EE. http://www.baldursgatemods.com/forums/index.php?action=downloads;sa=view;down=181 High Level Abilities this is needed in order to not break your game. These abilities are omitted in BG:EE and you must install this if you use my Level 40 Rule Set or another rule set/EXP cap removing mod. These are both betas. I need feedback mainly on the High Level Abilities mod to make sure everything works and there are no other files missing. To install the Level 40 Rule Set just open up the rar archive-open the level 40 folder and drop those files in your Override folder. You may need to create this which should be in you 766 folder. To install the High Level Abilities mod put it in your game folder and double click on the executable mod file and follow the install instructions. This is a Weidu mod after all which is necessary to get the text for the abilities. HLA's @ Version 1.06. Added missing creature files for druid transformation into an earth and fire elementals. Create an Override folder in your game's directory if it doesn't exist and extract the .2DA files to it. I use this, and am happy to finally, potentially, get some use out of monks, beyond their 1d12 hit die at level 10. But there seems to be a problem where everyone is asked, no matter their class, to choose abilities at level up, from a blank list, making the level up impossible. I understand that abilities are supposed to come automatically at level up, say, with traps and lay on hands, or what have you, for certain classes. Is this overriding that automatic selection, or the abilities list itself? Or is it the assorted BG2 tweaks that I've been messing with, and systematically uninstalling these last two hours? It seems to be that if I level up more than once at a time, using only your mod and CLUAgivemexp, it causes this. It might even just be a level 21+ thing. It is upsetting that I cannot get infinite power at the click of a button. At the risk of sounding like a bit of a fool, what does the rule set do exactly? Is it 'just' making the game more workable for people who remove the cap? Sorry for the stupid question, I'm fairly new to the BG modding scene. Level 40 rules is set so you can only go up to level 40 in your experience. Gods of the Forgotten Realms will level out at 40 in a single class. Those who want to play beyond a god would exceed that, hence the level cap remover. BG2 SoA you level out around level 16-20 depending on your class. ToB allowed you to be in the level 30s depending on your class and it gave you those special abilities. It sounds like the game doesn't include those special ability files. BG:EE does have a lot of BG2 resources in it. I'll have to take a look at it. It has energy blades and mass resurrection available for most mages, but nothing else for any of the classes. Would this be that advanced alacrity stuff people go on about? It will be a matter of grabbing them BG2, install them as a mod. At least I don't have to mess with the spell.ids since the abilities are already listed in that. More than a weekend project that I had planned. *Update* I created a high levels ability mod. Please read the first post in this topic. Download it again and install it. I forgot to add two files to it. So, are the original .2da files compressed in a .bif or something, and if so would these new ones conflict with the originals? The original .2da files are in a biff file and are never altered themselves. These files go in the override and can be deleted at your will and won't harm the original files. Anything that goes in the override folder, well basically overrides the game's files. I kind of feel stupid for just realizing this, but that does explain why its called the "Override" folder. It was a brilliant idea by the original designers where they could install fixes for their patches and latter on a place for us modders to put our files into the game. So what is different with the new .2da's we put in the override folder when compared to the default ones of bgee? It gives you the correct amount of hit points, spells, etc as you go up in EXP. The game's max EXP is 161,000 I believe which is around level 8-10 depending on what class you play. You may keep getting EXPs but the game stops you from going up in levels. This mod lets you keep going past level 10 and stops you at level 40. Nice work, has this been tested in multiplayer? And if so, does only the host need the mod, or does everyone in the party? As a rule of thumb when it comes to mods and multiplayer, its a good idea that everyone has the same mods installed to avoid any possible issues. CLABFI03.2DA: Wizard Slayer does not get 5% magic resistance every even level past level 19, she just gets 1% magic resistance every level. CLABRN02.2DA: Archer does not gain called shot ability past level 16 and does not get ranged bonus past level 21. CLABRN03.2DA: Stalker gets 2x backstab bonus at level 1-8, 3x bonus at 9-14, 4x bonus at 15-20 (confirmed on actual play; quadruple damage at level 15), 5x bonus at 21-28, 6x bonus at 29-34, 7x bonus at 35-40. Different from kit description. Stalker backstab in BGEE is much, much better than that of BG2/TOB, even better than the vanilla thief, who stops at 5x modifier. CLABTH04.2DA: Swashbuckler stops getting melee and AC bonus after level 20, but continues getting addtiona usage of set trap ability every 5 levels. CLABDR01.2DA: Vanilla Druid does not seem to get poison immunity at level 15, does not get elemental resistance at level 18/21/24. This applies to all druid kits as well (needs confirmation, since some abilities like Monk natural AC bonuses are coded elsewhere). CLABDR03.2DA: Shapeshifter stops getting additional use of shapeshift werewolf after level 13. CLABFI05.2DA: Barbarian melee resistance continues growing up after level 19, 5% bonus at every four levels (at 23, 27, 31, 35, 39). Final melee resistance reaches up to 45% at level 39. CALBMO01.2DA: Monk magic resistance continues to grow all the way up to level 40, reaching 120% and unlike TOB does not cap at 78% in level 26. AFAIK, the BGEE seems like it was coded with up to XP cap of 2,950k in mind mostly. Unsure whether BG2EE will faithfully recreate TOB rule system or change some, like Stalker kit. Thanks for the info. Looks like they altered the kit files as well. Most of them are fairly easy to correct... For example, Wizard slayer gets additional 1% MR every level from level 20 and in addition uses Monk MR ability (3%) at level 20, 22, 24 and so on so does not need any additional resources that BGEE doesn't have at the moment. Druid abilities should be easy to fix, simply copying the SPCL924-927 SPL files (doesn't even seem like need to modify dialog.tlk file, just need SPCL920B.BAM file; odd since it is the icon for tracking ability) should fix it. In fact, it looks one just need to copy a few files from TOB and it is highly likely to work very well. CLABDR01.2DA, CLABDR02.2DA, CLABDR03.2DA, CLABDR04.2DA: Vanilla Druid,, Shapeshifter, Avenger and Totemic Druid now get poision immunity at level 15 and 10% elemental resistance at level 18,21 and 24. Shapeshifter gets additional use of shapeshift werewolf ability every 2 levels past level 14. Funnily enough, Avenger gets additional use of shapeshift abilities at level 19. CLABFI03.2DA: Wizard Slayer gets 5% magic resistance, instead of 1%, every even level starting from level 20. CLABMO01.2DA: Monk MR caps at 78% at level 26. CLABRN02.2DA: Archer now gets ranged bonus every 5 levels, starting from level 18, and called shot every 4 levels ater level 16. CLABRN03.2DA: Corrected Stalker Backstab bonus: now gets maximum 4x bonus at level 17 and does not get further bonuses. CLABTH04.2DA: Swashbuckler gets melee and AC bonus past level 20. SPCL- files: necessary for Druid posion immunity and elemental resistance after level 15. Please note that those changes are not retro-active for the existing character! Just a question though : will I need to reinstall this everytime an update is made to the game ? You probably will if their update includes updating the dialog.tlk file since they over write it in their updates. 1) I've been able to install both mods, but when I tried testing if it worked with the CLUA Console, it won't let me level the PC beyond lvl 28 (5 mill xp). Anyone know why this is when it's supposedly a lvl 40 mod? I tried for a couple of different classes. 2) The updated files lehoo730 listed - are they compatible with the package included in the original post? If so, do I just paste them into the override folder to replace any existing files from the "original" package of files? @Avari : mmm weird cause I tested up to level 30 and it worked. For the updated files yes, you just have to drop them in the override and replace when prompted.